WASHINGTON — With a temporary injunction barring United Launch Alliance from buying Russian-made engines for its Atlas 5 rocket now lifted, the case brought by Space Exploration Technologies Corp. challenging the U.S. Air Force’s sole-source order of ULA rockets appears to be focusing on questions of timing, including whether the plaintiff met the deadline for filing its protest. By waiting until April 28 to sue the government in the U.S. Court of Federal Claims, lawyers say, SpaceX might have missed its 90-day window for challenging the procurement. SpaceX’s bid protest took an unexpected turn with the injunction, issued by Judge Susan Braden during an April 30 hearing on the case. Braden cited the possibility that ULA’s purchase of RD-180 enginesbuilt by NPO Energomash violated U.S. sanctions imposed on 11 Russian officials including Deputy Prime Minister Dmitry Rogozin in the wake of Russia’s incursion into Ukraine. Rogozin oversees Russia’s space industrial complex. Braden lifted the injunction May 8, two days after officials with the U.S. State, Treasury and Commerce departments told the court that no decision had been made to specifically label NPO Energomash, which is located just outside of Moscow, as a Rogozin-controlled enterprise. Additionally, “to the best of our knowledge, purchases from and payments to NPO Energomash currently do not directly or indirectly contravene” the sanctions, Bradley Smith, chief counsel for the Treasury Department, said in a letter to the court. The State Department’s letter echoed that sentiment, while Commerce deferred to the other agencies. In lifting the injunction, Braden wrote that should the government get any indication “that purchases from or payment of money to NPO Energomash by ULS, ULA, or the United States Air Force will directly or indirectly” violate the White House sanctions, the government must inform the court immediately. For its part, Denver-based ULA said keeping the injunction in place would cause “irreparable harm” because the company is a team member on two competitive launch proposals in the coming months. A ULA official said the proposals were for NASA’s Commercial Crew Program, two of the competitors for which plan to launch their astronaut-carrying vehicles on Atlas 5 rockets. Hawthorne, California-based SpaceX is the other bidder, proposing to launch a crew capsule atop its Falcon 9 rocket. Now that the injunction has been lifted, the case can focus on SpaceX’s specific complaint, which is that the Air Force should not award almost, but not all, of a large block of national security launches to ULA, its incumbent launch services provider, on a sole-source basis. The initial batch of rockets under the so-called block buy, designed to save the Air Force money via economies of scale, are already on order. During the April 30 hearing, Braden requested a timeline of key events in the case. Among the first points that need to be settled is whether SpaceX waited too long under federal procurement rules to challenge the block buy. Timothy McIlmail, a lawyer for the U.S. Department of Justice, which is representing the government in the case, argued April 30 that SpaceX lost its standing, or right to complain, by missing the 90-day window immediately following the solicitation for the work. According to the hearing transcript, 15 of the 36 ULA launch vehicle cores in the block buy have been ordered to date, the first in 2012. It is not immediately clear when the Air Force issued a solicitation for the work, which might have taken the form of a notice of intent to award the contract on a sole-source basis. The timeline is also expected to help resolve the question of whether SpaceX met Air Force certification requirements for launching national security payloads in time to compete for the contested launches. To meet those requirements, a company must transfer data to the Air Force from three successful missions of the rocket with which it hopes to compete. Lt. Gen. Charles R. Davis, the military deputy in the office of the assistant secretary of the Air Force for acquisition, said the Air Force has a more nuanced interpretation of Kendall’s memo. In the Air Force’s interpretation, turning over the data only allowed SpaceX to receive the request for proposals for the missions in question, Davis said in an interview. The Air Force still must certify all of the required data before it can actually award contracts, he said. Without certification and careful mission assurance, the Air Force risks repeating a stretch in the late 1990s when it suffered six launch failures over 10 months, Davis said. The satellites lost in those failures were worth about $5 billion and would have provided critical capabilities to the U.S. defense and intelligence communities, he said. 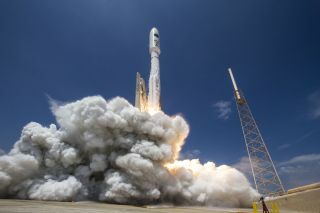 When the Air Force announced its block buy strategy in late 2012, it also said it would award an additional batch of missions on a competitive basis, giving so-called new entrants like SpaceX a chance to compete. At the time, Davis said, SpaceX told the Air Force it expected to have the Falcon 9 rocket fully certified by January 2014. SpaceX is now expected to earn certification in March 2015, Davis said. The Air Force is currently spending $60 million and has 100 staff members working that process, he said. Meeting the March 2015 certification date is important because the Defense Department would like to competitively award a contract to launch a National Reconnaissance Office mission in April or May 2015, Davis said. Follow Mike on Twitter@Gruss_SN. This story was provided by SpaceNews, dedicated to covering all aspects of the space industry.